Available Discount Codes: Use this link to get $5 off! Improv Traffic School has been around since before you could even take traffic school online, so this is one of the big players. They were also one of the first to offer traffic school and drivers ed online. Over the past few years, they have risen through the ranks quickly by expanding their courses to more areas. The bottom line is, this is one of the least boring and most entertaining traffic school courses available. It puts a humorous spin on a very boring topic. 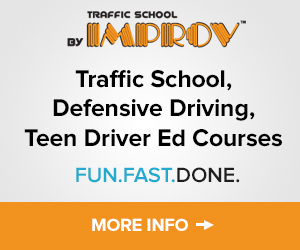 Improv traffic school offers both online traffic school and online drivers education courses. Here are the states that Improv Traffic School is currently certified in. Improv Traffic School also offers Corporate Driving Safety Courses for private and government organizations. Company Reputation: This company has been around for decades and has maintained an A+ rating with the Better Business Bureau. This is the same company that runs the nationwide Improv Comedy Club chain. So, not only is this traffic school backed by a legit company with many years of experience, but they have great online reviews and have had MILLIONS of people go through their courses. 100% Money-Back Guarantee: Like any other legitimate online traffic school, Improv Traffic School offers a 100% guarantee up until you take the final exam. In some states, you may even be able to start the course without even entering any payment info. You should NEVER sign up for an online traffic school that does not offer a guarantee. 24/7/365 Customer Support: Unlike many other online traffic schools, you aren’t forced to get customer service during their business hours. These guys work around you with 24/7/365 customer support via phone, live online chat, and email. Traffic schools are certainly not known for their level of customer service, but if you have any issues, Traffic School by Improv will take care of you. “Edutainment”: Improv Traffic School says their goal is to entertain while you learn. They know traffic school is boring, so they provide you with funny videos, cartoons, and humorous stories mixed in with the content. The course was created by a group of Hollywood stand up comedians so it actually is pretty funny. This is by far the least boring traffic school we’ve taken to date. Updated Course Content: There is a big problem that plagues the majority of online traffic schools out there. Most of them hardly ever update their content. The course material with Improv Traffic School is updated on a fairly regular basis, so you’re not going to be stuck with some “flash” based course that doesn’t work half the time. Mobile Friendly: Imagine you’re sitting in your favorite spot in front of the TV wearing your PJ’s. You couldn’t POSSIBLY complete traffic school while doing that, could you? Of course you can! Fortunately, Improv Traffic School will work on just about any device you have. So whether you want to use your desktop, laptop, iPhone, Android, or tablet, you can get your traffic school done from anywhere. No Course Timer For Some States: In some states, such as California, there is NO course timer. That means, you can get through the course as fast as you can pass all the quizzes and exams. It doesn’t get faster than that. Fair Pricing: Many of the “cheap” online traffic schools out there are outdated and provide almost no customer support. Not only is Improv Traffic School priced right, but ” target=”_blank” rel=”nofollow”>you can save an extra $5 by using this discount link. Free Comedy Club Tickets: This is a pretty cool touch. If you take their course, you’ll get a pair of free tickets to one of the many Improv Comedy Clubslocated across the country. Tickets usually run $20 to $30, so it’s actually not a bad freebie if you’re into the comedy scene. State Requirements: While it’s not really the fault of Improv Traffic School, some states have certain requirements that are VERY annoying. For example, you may need to go through an “identity verification system” to make sure you are really the one taking the course. These verifications systems are prone to having issues, which is one reason to find a traffic school that has 24/7 customer support like Improv has. Some states will also be required to have a course timer used during the course. There’s nothing Improv Traffic School can do about that, but it’s annoying nonetheless. Some Of The Humor Is A Bit Cheesy: Most of the course is pretty funny, but some people might not enjoy the corny jokes they use. For example, while explaining how to properly stop at a stop sign, they reiterate that STOP does not mean “Slow To Observe Police” (hardy-har-har). There are cheesy jokes like that spread throughout the course, so be prepared! We found it to be rather funny, but this course is best for those with a good sense of humor. If this course is available in your state, there’s really no reason to NOT sign up unless you have virtually no sense of humor. With millions of people having already taken their course, positive online reviews, a guarantee, an updated mobile friendly course, decades of experience, 24/7/365 customer support, and an entertaining approach to traffic school, there’s really nothing else you could expect. Improv Traffic School easily gets our 5 star rating, making this one of the best online traffic schools available. Certified in the states of Arizona, California, Delaware, Florida, Georgia, Idaho, Indiana, Michigan, Missouri, New Jersey, New Mexico, Nevada, New York, Texas, and Virginia. Over 3,000,000 drivers have already used this course. Comedy based course makes it entertaining. Modern and updated material with interactive features. 24/7 US based customer support. 2 free tickets to Improv Comedy Club included! Good course. Super easy and pretty funny. More importantly I got it done fast. Very funny and got it done fast. Use the link here to get $5 off the regular course price. Got my two free tickets to the Improv Comedy Club too! Funny, fast, easy test, and free comedy club tickets. I’ll do traffic school through Improv every time. Thanks guys! This was fast, easy, cheap, and even a bit humorous. Would sign up for again. I took it in New York. No complaints but it could be updated in some places so one star removed for that. Otherwise great job. Easy and actually pretty funny. Got it done fast. I personally didn’t think it was that funny but it was fast and cheap so still 5 stars in my book.